The business media is full of the meltdown of the Chinese stock market, the credit bubble and impending crash in the Chinese economy. But less well announced is the dangerous economic slowdown and already unfolding debt crisis in ‘emerging economies’ in general. So for the first time since the emerging market crisis of 1998, all the large so-called BRICS (Brazil, Russia, India, China and South Africa) are in trouble. And so are the next range of ‘developing’ economies like Indonesia, Thailand, Turkey, Argentina, Venezuela etc. Previously rising commodity prices in oil, base metals and food led to fast growth in many of these economies. This in turn led to a flood of capital from advanced capitalist economies by banks and companies looking for higher profits than available in their economies. But the commodity boom has collapsed. Global commodity prices continue to plunge. Bloomberg’s commodity price index, tracking gold, crude oil and other raw materials, is down to its lowest point since 2002. It has fallen by 40% since 2011. It’s another indicator of the long depression and deflationary pressures in the world economy (see my post: https://thenextrecession.wordpress.com/…/the-spectre-of-de…/). That’s partly because of the Great Recession and the weak recovery afterwards has reduced demand for energy and industrial materials. And it is partly because the biggest consumer of these goods, China, has seen its economy slow in growth from double digits to (just) 7% a year or even lower. 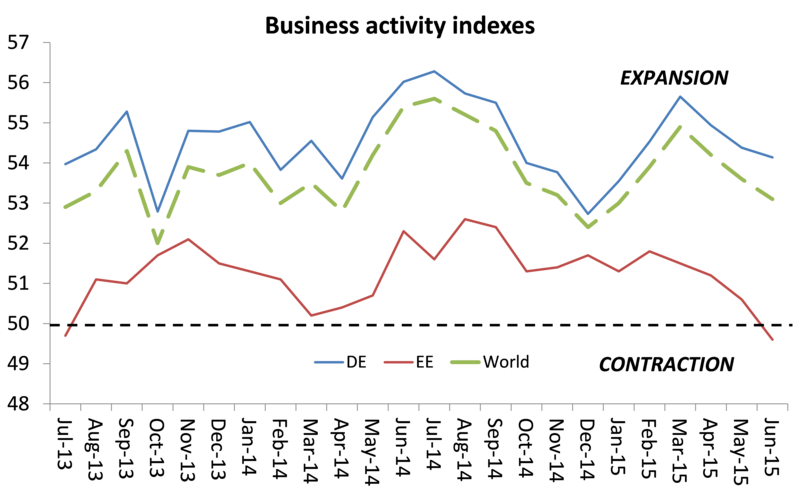 Inflation in many top economies has given way to deflation in prices (in Europe and Japan). The latest ‘flash’ estimates of business activity globally, based on the so-called purchasing managers indexes, show that emerging economies are now contracting for the first time for over two years. 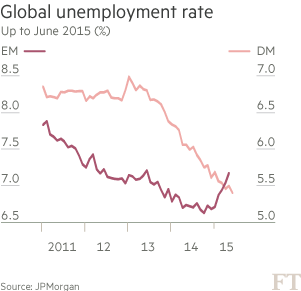 Unemployment across emerging markets has risen sharply this year, reversing a six-year slide, even as it has continued to fall in developed countries. Across emerging markets, unemployment has risen to 5.7 per cent, from a cyclical low of 5.2 per cent in January, the sharpest rise since the global financial crisis, according to figures compiled by JPMorgan. During the emerging market boom, capital flowed into the emerging economies and corporations in Asia and Latin America ran up large debts. Now the money is flowing out, not in and profits are falling as prices for commodities and sales of even for hi-tech goods are falling. Investors pulled a net $4.5bn from EM funds in the week through July 30, according to data from EPFR, compared with $3.3bn a week earlier. A total of $14.5bn has now been redeemed from EM funds over the past three weeks alone. 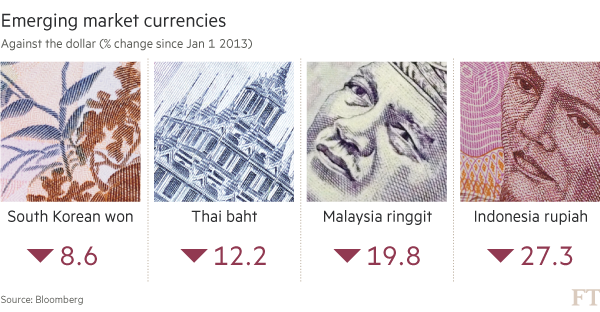 And currencies across Asia are dropping like stones. 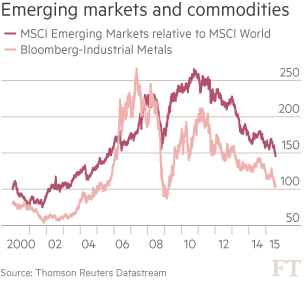 And the US is poised to raise rates in September, so emerging markets could suffer further instability as the cost of servicing that debt rises in dollar terms. A debt crisis is emerging. 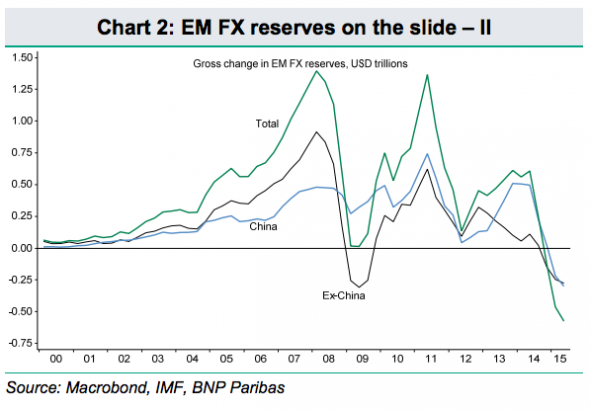 The latest data on foreign exchange reserves show a sharp fall in dollar reserves. The reserves of emerging market governments have slumped as these governments experience declining trade surpluses and weak domestic economies, leading to a flight of money. The IMF’s COFER figures, the measure for FX reserve data, show that emerging-market reserves have dropped for three successive quarters, from a peak of $8.06trn at end Q2 2014 to $7.5trn by end Q1 2015. These analysts reckon that emerging-market reserves have fallen $575bn since the middle of last year, the sharpest decline in 20 years. Capital is fleeing these ’emerging economies’ as their real GDP growth slows and investment drops off. Investment bank JP Morgan reckons that the debt of non-financial corporations in emerging economies has surged from about 73% of GDP before the financial crisis to 106% of GDP as of 4Q14. This 34%-point increase is enormous, averaging nearly 5%-points per year since 2007. In previous research, the IMF has found that an increase in the ratio of credit to GDP of 5%-points or more in a single year signals a heightened risk of an eventual financial crisis. Many emerging market economies have registered such an increase since 2007. Hence the conclusion of the credit analysts, S&P, that “we have reached an inflexion point in the corporate credit cycle”. 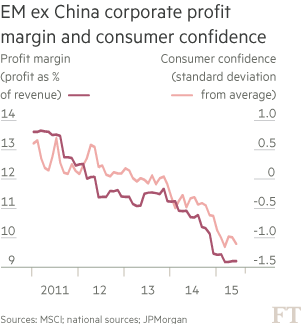 Alongside rising debt are falling profitability and consumer demand in emerging markets outside China. Falling commodity prices for emerging economy exports, rising corporate debt, falling profitability and demand, significant capital outflows and the probability that the US Fed will hike rates this autumn/fall and increase debt servicing costs. It’s a concoction for a serious crash/slump in the great ‘growth’ story of the ’emerging’ economies. This entry was posted on August 1, 2015 at 9:29 am and is filed under capitalism, economics, Profitability. You can follow any responses to this entry through the RSS 2.0 feed. You can leave a response, or trackback from your own site. The real problem appears to be not underconsumption of these primary products, but overproduction, which is typical of this phase of the long wave. After the new long wave boom began in 1999, supply of these primary products could not expand fast enough from existing sources of supply, and consequently prices and profits for this production rose sharply. Copper was as always the classic example. As I have cited elsewhere, copper producers will only invest in additional production, when they see high prices for a prolonged period. That happened and large scale investment took place in Central Asia, Africa and Latin America. It takes seven years to get a copper mine into production. Now all of that investment has come on stream – the same thing has happened with oil and food production, witness the frackers, and the fact that global milk production has risen so much that a glut now means milk is cheaper than bottled water, whereas in 2007 we had food riots due to rising food prices and shortages – supply has risen faster than demand. The classic overproduction that Marx describes. As i wrote some time ago, its also creating a problem in capital markets, because these former recipients of large rents were the suppliers of large amounts of loanable money-capital, which is one cause of falling interest rates over the last 30 years. Now they are increasingly draining money-capital from those markets rather than contributing to them. Hence Saudi Arabia went into the capital markets to borrow for the first time in 8 years last week. It will be a cause of rising global interest rates, as will the fact that these economies will be forced to raise official interest rates to protect their currencies and stave off imported inflation, as they did last year, when the taper tantrum led to a rapidly rising dollar and collapsing EM currencies threatening sharp rises in their inflation. I’d expect a lot more cases of financial crises such as the crash in the Shanghai Stock market, as these interest rates rise, thereby causing the prices of all fictitious capital to crash. Its part of the objective divergence of interest between productive-capital and fictitious capital, that is being reflected in political conflicts between conservatism and social democracy, such as in Greece, and the EU on a larger scale. A long boom since 1999? I’m sorry Boffy but I can’t agree with that. Excepting China and a few others it’s been quite the opposite. You need to progress from the mechanical views of Kondratiev and learn about Ernest Mandel’s views on this topic. I mean really I don’t think you have any proof to back it up do you? I think you should read Mandel on Long Waves again. You should read Mandel on “The Second Slump”. The idea of a Long Wave Boom, does not at all mean that during the whole of this period there is a continuous rise. Mandel describes 5 periods of recession during the 25 years of the post war Long Wave Boom, for example. As far as proof of such a Long Boom is considered, since 1999, I think there is plenty, as I’ve set out elsewhere. I never said anything about continuous expansion. Of course the business cycle operates throughout long waves but in expansionary ones the crisis is shorter and less severe. Can you say that the slumps we’ve experienced since 1999 are mild ones? Also what exogamous factors set off the 1999 boom? Nothing comes to my mind. Those frequent recessions of the post world war 2 boom by the way were signs of rapid development of the means of production. Not so rapid now. Again, read Mandel on The Second Slump. He compares the 1957 crisis with that of 1930-33, and says that in terms of sharpness etc., they were initially the same. The difference in 1957, he says, is that Keynesian demand management was used to cutting it short. The difference after 2008 has been that other than for a very short period no such Keynesian intervention has been used. In those places where it was, used for longer, for example in the US, the recovery was pretty traditional, despite attempts by Republicans and Tea Partiers to frustrate it. The whole point about the difference between a period of long wave boom such as after the post war, compared to a period of long wave crisis or stagnation is that such measures can be used to cut short recessions. The fact that they have not been used during the current cycle, is down to political factors, i.e. the dominance of conservative regimes. In fact, just as Keynesian ideas continued to dominate into the 1970’s, when they were no longer applicable, so now the rejection of Keynesian ideas, and a continuation of Austrian and Monetarist ideas, have continued to dominate after they were no longer applicable, and their use has resulted in the blowing up of fictitious asset bubbles, which themselves act to limit the growth of productive capital. Take another example, the period from 1843 to 1865, was a period of long wave boom, rapid growth, huge rates of profit, and large masses of profit, as Marx and Engels describe. But, if we take the 1847 crisis, which has many features similar to 2008 – money-capital drained from productive activity into Railway speculation, and so on on, a credit crunch that leads to a financial panic – Marx says that there followed a 37% contraction of economic activity! I would say that was a pretty severe slump at the height of a period of boom, wouldn’t you! The mechanism of the long wave cycle are not driven by exogenous, but endogenous factors, as I have set out in the posts linked to above. I have set out the mechanisms of that cycle in Parts 23-24. In summary, in the Autumn (crisis) phase of the cycle, extensive accumulation has caused a relative shortage of labour, wages rise squeezing surplus value, material prices may also have risen causing realised profits to be squeezed as Marx sets out in Capital III, Chapter 6. Either way, the higher cost prices causes the rate of profit to be squeezed, crisis become more likely. Capital responds, as Marx sets out in Value, price and profit, and in Capital III, Chapter 15, by innovation to introduce labour-saving technologies, which was seen in the late 70’s, and through the 1980’s. Accumulation becomes intensive rather than extensive. The OCC thereby rises, so that as Marx sets out, the means by which Capital resolves crises of overproduction is through the tendency for the rate of profit to fall, which results from this higher OCC brought about by the move towards intensive accumulation, and labour-saving technologies, which raise productivity. It also brings about a significant moral depreciation of existing fixed capital, and slashed the value of circulating constant capital. It creates the basis thereby for a rise in the rate of profit, which was seen in the late 1980’s and through the 90’s. That also leads to the fall in the rate of interest, as this large rise in the lass of realised profit, exceeds the demand for money-capital, in the way Marx describes in his analysis of the credit cycle. The exogenous factors which create the basis for the new boom starting in 1999, are thereby established a high and rising rate of profit, large accumulations of money-capital, low and falling interest rates, available supplies of exploitable labour-power, new technologies, which provide a range of new industries and commodities into which capital can be invested – computer technology, the Internet, bio-technology, space technology, materials technology, gene-technology and so on – where the organic composition of capital is low (often due to a high level of employment of very complex labour, and little in the way of circulating constant capital). As with most previous long wave booms, it goes along with the shifting of the baton of progress to new geographical areas, i.e. China, Asia and increasingly now Africa. I don’t understand your point about the crises after WWII being about rapid development of the means of production, compared with the situation today. We have all around us the obvious signs that the means of production are being developed at a pace never before seen in human history! Its why there is discussion, such as over Paul mason’s book, about whether machines could simply repalce labour altogether! As I set out in my posts on the long wave, for the first time in human history, the growth of productive-capital has been such since 1999, that the global workforce has increased by more than a third, and the working-class is now the largest class on the planet. Between 2002-2007, the annual growth in world trade was 15 times what it was between 1980-90. In the first decade of this century, the production of goods and services accounted for 25% of the total goods and services produced in Man’s entire history on the planet! Computer technology is now supplementing human ingenuity to increase technological development at a pace never before conceivable in almost every area you can think of, which is why we are seeing medical advances, for example, by use of gene therapies, the use of genetically modified viruses to kill off cancer cells and so on. Far from being “not so rapid now”, we are going through a period of unprecendented technological change, and development of the productive forces! “The difference after 2008 has been that other than for a very short period no such Keynesian intervention has been used. In those places where it was, used for longer, for example in the US, the recovery was pretty traditional, despite attempts by Republicans and Tea Partiers to frustrate it.”– Boffy. Not so. So not so, an uncharitable sort might call Boffy’s characterization complete and utter rubbish. The recovery in the US, officially beginning in 2009 and now in its so-called 6th year has been slower and more shallow than almost all the post WW2 recoveries. The WSJ, using data from the US Dept. of Commerce, reported on Friday July 31, 2015, that 6 years into the recovery, total US GDP growth is less than it was in the 5th year of the recovery from the 2001 recession; less than it was in the 4th year after the 1991 recession; less than it was in the 3rd year of recovery after the 1982 recession; less than it was in the 3rd year of recovery after the 1970 recession; less than it was in the 3rd year of recovery from the 1961 recession. Review and revision of data from 2012 by DoC has lead to a downward revision in previous reports of overall growth. Anyway, that’s only of concern to those of us who think that real data is real important. And there’s this on the international scale: using data from the WTO on the growth of world trade, with the base years 1990, and 1999, the growth in the volume of world trade from 1990-1999 is approximately 67% during the so-called end of the long wave downturn; with 1999 as the base year, growth from 2000 to 2008 in the volume of trade is approximately……66 percent. Well we’re back to square one where I pointed out you have a mechanical view of the long wave process. I guess I should have explained further regarding post world war 2, there were more frequent recessions because of shorter turnover of fixed capital. Recessions now are happening at the usual rate, have been since the 70’s. The elephant in the room here is China, China has had a long boom, in fact a long boom without slump experiencing growth surpassing what western economies experience during long booms. This has altered the world economy without a doubt but the rising Chinese tide hasn’t lifted the western boats enough. Indeed now that China is slowing down commodity prices are dropping. Low commodity prices, lots of capital being either hoarded or invested unproductively, we’re in deep Winter territory here Boffy! But we wont see Spring unless factors external to the business cycle kick in. As far as technical innovation, micro-computers, the internet, cell phones etc were developed during the long depressionary wave that I believe still continues. A depressionary wave can have substantial innovation. It’s true automation is poised to take a qualitative leap, if we get to Spring. The whole point of Ernest Mandel’s studies is that Spring is not assured. One last point, during an expansionary long wave the position of the working class improves, in wages and organisation. The experience of post 1999 has been the opposite. I don’t understand your claim that anything I said reflects any kind of mechanical conception of the long wave process, any more than Marx’s analysis itself of capitalist development is based upon such objective material laws and processes. Mandel identified five recessions in the 25 years of the post war boom. That is one every five years on average. On what basis do you claim that recessions are currently occurring more frequently than that? Its wrong to focus your attention on what is happening in the US and western Europe as the be all and end all of global development. Moreover, despite the worst financial crisis in history, the fact remains that even western economies have grown since 1999. In fact, in 2007, for the first time since 1969, not one single economy in the world was in recession. 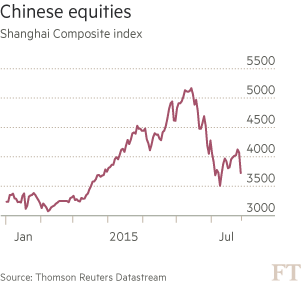 You cannot explain falling commodity prices by the fact that China is slowing down. Slowing down still means growing, and for the world’s second largest economy (largest on PPP) to be growing at 7%, or whatever lower figure you may want to pick, still means growth in demand for primary products. The IEA forecast global oil demand to be higher this year than last year, and to be around 2-3% in 2016. On what basis do you claim that rising demand amounts to underconsumption and falling prices? The lower prices are the consequence not of lower demand but of rapidly higher levels of supply along with the effect of technology in raising productivity and thereby lowering production costs. Similarly, global food demand is forecast to rise by an average 1.5-2% p.a. in the next few years, yet global food prices are falling. Milk and dairy products demand continues to rise, and yet there is a massive glut in milk, not because of slowing demand, but because of rapidly rising supply. Far from being in Winter territory, we are clearly in Summer territory with indications of labour shortages and rising wages. The base technologies that made personal computers, the Internet and so on possible began to be developed in the late 1970’s, as I stated, and that is the case with every long wave cycle and associated Innovation Cycle, but again in line with that cycle, these technologies are only introduced slowly at first, as replacements of existing technologies. The internal combustion engine was developed as a technology long before motor cars were introduced. Similarly, its only been since the early 90’s, that personal computers became consumer items, I remember in the mid 90’s, my employers starting to introduce mobile phones, and it was only by the late 90’s that they became widespread. Similarly, very few people used the Internet at that time, and its expansion has really only occurred over the last 10-12 years. What we are now witnessing, typical again of the Summer phase, as a conjunctural shift from where the commodities and means of production based on those technologies start to form the basis of extensive rather than intensive accumulation. In other words, where these technologies replaced existing technologies – for example, I remember my Council used radios to control its bin lorry fleet, and only replaced radios with mobile phones in 2001 – in the previous Spring Phase, they now become in the current Summer phase, rolled out on an extensive basis. The same thing was seen in the post war boom, when mass production techniques replaced previous production methods at first, but then – although there were obvious improvements in these systems – the emphasis by the 1960’s became an expansion of the number of car plants, larger assembly plants, more assembly lines and son, as the form of accumulation, and basis of raising production levels. Try telling the tens of millions of workers in China, other parts of Asia, Latin America, and developing Africa that their position has not improved since 1999. Moreover, its you that is now applying a rather mechanical approach. It is never in the Spring Phase of a long wave cycle that the real strength of the working class develops, because during that phase, and partly a a basis of it, there are large reserves of exploitable labour, and the very process of intensive accumulation means that production can be increased rapidly without a requirement to increase the demand for labour-power. The Spring Phase enables workers to rebuild their organisation, it is only in the Summer Phase, that this renewed strength, together with a relative increase in the demand for labour-power leads to more militant struggles, as for example happened in the 1960’s. No it doesn’t happen straight away but we’ve had 16 years by your count, we’re two thirds through your long boom and American unionization is at an all time low. Yes Chinese workers are better off um doesn’t that prove my point? You have this whole Bernstein-esque liberal capitalism peacefully progressing to capitalism, was the transition from feudalism so neat? Rather then rubber gluing me you might want to deal with original point, after all the post world war 2 expansionary wave only began after a major conflict which saw America become the chief imperial power and consciously re-order world capitalism. As regards the first expansionary wave it was gold discovered in California and Australia plus revolutions in Europe opening up the continent to Britain. The second was started by gold discovered in South Africa plus the scramble for Africa. Even many social democrats supported imperialism as an economic necessity, it wasn’t just some vanity project for the great capitalist powers involved. Now was there some major gold rush in 1999 I didn’t hear about? Was America’s victory in the Balkan conflict enough to re-order the world market? I don’t know if you realise how much of what you say here is an example of the mechanistic approach of which you complain. First, of all you equate a rise in political and industrial organisation solely with unionisation in the US. In so doing, you cut out labour organisation that has grown in Asia, Latin America, parts of Europe, and Africa. You also cut out all of the unionisation of workers in the Middle East and North Africa that occurred consequent upon the economic growth that occurred there after 1999, which led up to the Arab Spring. Before you say the Arab Spring failed, let me point out that in the Long boom that started in 1843, workers in Britain organised in the Chartist Movement, and workers across Europe also organised leading to the revolutions of 1848, and the culmination of the Chartist Movement. They all failed too. It didn’t mean that the boom was any less real, nor did it stop the objective laws underlying that boom, leading to workers wages rising further in the following period, as Marx sets out in Value, Price and Profit. Then we could talk about the rise of social democracy in Latin America in places like Brazil, that has replaced the former Bonapartist and militarist dictatorships there. We could talk about the collapse of the centre in Europe, and the rise of Syriza and Podemos, and other social democratic and left populist forces. We could refer to the Occupy Movement in the US itself. The only way you can fail to recognise any of these is if you have a very mechanical view of how objective laws play out in a variety of phenomenal forms. I don’t think there is anything Bernsteinesque whatsoever in anything I said. All I have said is a repetition of what Marx says, which is that there are no permanent crises. The objective laws of capitalism lead to cycles of prosperity, boom, crisis and stagnation, to use Marx’s definition, and the objective laws mean that the conditions created in the period of stagnation, themselves create the basis for the next period of prosperity, and so on. In fact, its the opposite of bernstein, because here, as Marx sets out, there is nothing in this continual cycle repeating itself only on a higher level, which leads to either a breakdown of capitalism, or some automatic transition to Socialism. On the contrary, its the catastrophists, who believe that Capitalism will collapse, and that somehow this will lead to Socialism, whereas all history tells us it will rather lead to chaos, a demand for order, and the introduction of severe reaction. There is not much chance of the collapse of capitalism in Libya leading to socialism any time soon, for example. If it was WWII which caused the post war boom, why didn’t WWI have that effect? In fact, you are historically wrong anyway, because the start of the long wave boom was already evident prior to WWII. In the UK, by the mid to late 30’s, whole new industries – the ones which were the basis of the boom after the war – such as motor car production, consumer electronics industries, petrochemicals – had been created in the Midlands and South-East. The wages of workers in these industries was relatively high and rising. It led to a surge of house building in those areas, and workers for the first time there starting to become home owners. It also led to new construction methods, as these suburban areas were built. In fact, one of the reasons for the Jarrow Marches themselves was to point out to the workers in these newly growing more affluent areas, that workers in the North-East and elsewhere were still suffering. But, furthermore, you assume that things such as imperialist wars are not themselves a result of objective laws of capitalism. Quite the contrary as Trotsky points. Lenin and Trotsky got the explanation wrong, because they still saw the world and imperialism in terms of Colonialism rather than Imperialism proper, but the point remains. The two world wars in Europe were about the same thing as the Civil War in the US, the need for capital to concentrate and centralise into a European State, because industrial capital had burst beyond the limitations of national borders, and as in the US needed a much larger domestic market, and single state to stand behind it. “Was there some major gold rush in 1999?” Well in 1999, the gold price stood at $250 an ounce, by 2011 it had risen to nearly $2000 an ounce. In the meantime there was indeed a huge gold rush. It has involved a massive amount of investment in gold mines in Central Asia, Africa and Latin America. It has gone along with the huge investment in mines and quarries for copper, and other minerals, whose prices also rocketed in 1999, as global demand for them soared, as the new boom got under way. The same is actually true about those other gold rushes. What material factors do you think it was that led people to go in search of new sources of gold? It was precisely that the price of gold had risen, and the reason it had risen was that demand for it had risen, as economic activity increased, which pushed up its exchange value relative to other commodities. In other words, exactly the same pattern that has been seen in every previous long wave cycle! You still haven’t responded to my questioning of your assertion about there being more frequent recessions after 1999, than there were during the post-war boom. Let me cite to you again the actual data, which challenges your assertion, and points to the start of a new boom after 1999, as well as providing additional data. According to the ILO, the world labour force has grown by around a third in the first decade of the century alone. The number of workers employed in industry has risen by around 30% or about 150 million workers, the number employed in services has risen by 35%. This incessant demand for labour-power pushed up nominal and real wages significantly. That was manifest in a sharp rise in global food demand, as the higher living standards of these workers was first translated into a better diet. In 2005, Chinese consumption of Meat was 2.4 times what it was in 1990, Milk 3 times, Fruit 3.5 times, vegetables 2.9 times, fish 2.3 times, whilst its consumption of cereals mostly rice fell by 20%. The large rise in demand from China and other developing economies, was part of the reason for the spike in global food prices at the end of 2007 and beginning of 2008. Demand for food rose so sharply that shortages began to appear, which along with the price spikes caused riots in a number of countries in 2008. Although global food demand is higher today no such shortages are likely, as the higher prices have led to an expansion of supply, including the development of large scale, industrialised farming in a number of parts of Africa, such as Angola. The increasing production of China and other rapidly growing economies also sucked in larger and larger quantities of raw materials as well as food. Global GDP rose from around $41 trillion in 2000, to nearly $72 trillion in 2012. Between 2002 and 2010, Global fixed capital formation rose from $7 trillion to $14 trillion. Of all the goods and services produced in Man’s entire history, almost 25% have been produced in the first decade of this century alone! From 1999 on, commodity markets turned sharply upwards, as demand for all raw materials, and foodstuff increased sharply as the new Long Wave Boom began. It saw steady increases in the prices of Copper, Oil, Corn and almost every other commodity, as global demand, fuelled by rising economic activity in China, and other BRIC economies, as well as the rising demand of millions of new consumers in those economies rose sharply. In 2007, Bridgewater Associates in its comprehensive survey found that for the first time since 1969, not one single economy in the world was in recession. It was not just the BRIC economies that were experiencing rapid growth like China’s growth of around 10-12%. On the back of its demand for food and raw materials, economies in Latin America were growing rapidly, and for the first time economies in Africa and Central Asia were beginning to grow rapidly too. Azerbaijan grew at around 26% as did Angola, whereas Mauritania grew at around 18%. However you look at it, this means that the growth in the rate and mass of surplus value during this period is undeniable. For a Marxist, capital is congealed surplus value. The question those who deny that the rate and mass of surplus value rose, during this period, have to answer is this. If it didn’t, where did all this vast amount of new capital come from. In June 2008, with UK inflation, even on official estimates, running at 4%, Alistair Darling appeared on the Andrew Marr show appealing to workers to keep their wage claims below 2% to avoid a wage-price spiral! The reason for his comments was that petrol tanker drivers had just won a 14% pay rise after a relatively short strike. Right up to the point of their victory, the media had been saying that the workers demand was ridiculous and unachievable. Similar things were happening in Germany. In fact, concern at rising inflation had already led in 2007 to official interest rates rising in the UK, US and Eurozone, which was enough to provide the spark for the credit crunch which caused house prices in the UK to fall by around 20%, and led to the collapse of Northern Rock, plus a number of other small building societies that had abandoned the idea of attracting funds from savers to finance their lending, and instead relied on borrowing themselves in the money markets. In the US, UK and EU, the recovery assumed the normal “V” shape, at least until 2010. After that point, there is a clear divergence between the US and the other economies, as the former continued to apply fiscal stimulus, whilst the latter embarked on a disastrous course of austerity, that sent their economies back into recession. The US itself would undoubtedly have recovered even faster had it not been for the influence of the Tea Party, and right-wing Republicans in limiting the application of fiscal stimulus. This is a clear indication of Marx’s point about the way the representatives of fictitious capital can cause economic crises, purely in order to defend the prices of fictitious capital. In Europe, those stronger economies that did not have large debts, and did not apply austerity themselves, continued to grow strongly during this recovery period. The annualised GDP growth rate for Germany, for example, starting with the first quarter of 2010 was for each quarter, 2.5, 4.3, 3.9, 3.8, 5.2, 3.4, 2.9, 1.6, 1.8, 0.6, 0.4, 0, – 1.6, 0.9, 1.1, 1.3. In other words, growth was robust through to the fourth quarter of 2011. As I’ve pointed out previously, this pattern can be seen elsewhere, because the slowdown in the third quarter of 2011, reflects the effect, of the 3 year trade cycle, which causes growth to slow for around four quarters. (Note that this is a normal cyclical slowdown NOT a recession). In addition, the imposition of austerity measures in the UK, and the European periphery in the second half of 2010, itself impacts growth on a wider basis. But, Germany was by no means the only European economy to enjoy robust growth in its recovery from the 2008 crisis. The annualised GDP growth figures for Sweden, were for example, 3.8, 6, 7.6, 7.7, 4.9, 3.5, 3.7. In fact, Sweden had positive growth on an annualised basis from 2011 through to 2014. And, of course, if Europe affected by a self-imposed austerity was managing to grow at these levels, it is no surprise that China continued to grow at the same kind of levels it had prior to the crisis. And emphasising precisely this point of the effect of austerity measures restricting growth, the US itself grew at 1.6, 2.7, 3, 2.8, 2, 1.9, 1.5, 2, 3.3, 2.8, 3.1, 2, 1.3, 1.6, 2, 2.5 again reflecting both the effect of the three year cycle, and of the political crises imposed by the Republicans over the Debt Ceiling and the Sequester. But, the nature of the crisis as a North Atlantic crisis rather than global crisis is perhaps most clearly seen by looking at the figures for the latest area of the globe to enter the process of rapid industrial development, spurred by the new Long Wave Boom – Africa. Nigeria, hardly noticed the crisis. Its GDP growth rate dipped in just the first quarter of 2009, dropping from 7.1, to 4.5, before jumping back again to 7.5 %. Throughout the rest of 2009 through to 2012, its growth rate only dipped below 7% in one quarter (to 6.96%), and in most quarters it was above 7.5%, including being at 8.6% in the fourth quarter of 2010. In the period from the start of 2012 its growth has been above 6% in every quarter, and is rising again, reaching 6.8 in the previous quarter and 7.72 in the latest quarter. Nigeria is now challenging South Africa for the number one spot in Africa. South Africa did see its growth drop in 2009 as a result of the crisis, but from the start of 2010 its growth was around 3.5% in each quarter up to the end of 2011, when in line with the three year cycle, it fell back to between 2% and 3%. The developing sub-Saharan Africa region as a whole fell from growth of almost 10% in 2004, to around 6% in 2007, and down to 2% in 2009. But, it again quickly bounced back to growth of more than 4% in 2010, before itself succumbing to the effects of the three year cycle, with growth in 2011 of just under 4%. The Arab Spring was itself in large part the result of strong economic growth in the Middle East and North Africa (MENA) over the previous period, especially as it was drawn into the periphery of the EU. Like the revolutions of 1848, it was this economic growth, which led to the greater economic and social weight of the big bourgeoisie and the working-class, which, as in Europe is the force behind the development of modern social democracies. The dip in economic growth in Egypt, in 2011, which provided the spark for many of the strikes and demonstrations, seems to be highly correlated to the imposition of austerity measures in the EU periphery, and again to the onset of the three year cycle in the second half of 2011. In Latin America, Brazil which had been growing at around 6-7% on an annualised basis in 2008, fell into negative growth for three quarter in 2009, but then quickly rebounded to growth of around 9% by the middle of 2010. It also suffered from the onset of the three year cycle in 2011, but even then its growth remained around 1%, before climbing again in 2013. In short this is very similar to the picture that Marx and Engels describe in relation to the financial crisis of 1847, where once the credit crunch is resolved, the real economy resumes the boom that was in place. What is different today to 1847 is that economic weakness is being inflicted in various important areas, e.g. the EU and UK, as a result of political decisions, austerity. Moreover, in 1847, the speculative bubbles were allowed to burst. This time they have been reflated, which is draining potential money-capital from productive investment. As Haldane has pointed out in 1970, only about 10% of realised profit went as dividends and other returns to shareholders and today that figure is more like 70%, and according to Clinton, the figure is even higher in the US. Again this is Marx’s point about fictitious capital ruining productive-capital. The 2008 crisis has been called the North Atlantic crisis in much of the world outside the North Atlantic area, where it is referred to as a global crisis, and the Great Recession. That simply shows the failure of economists in the North Atlantic area to come to terms with the fact that they do not sit at the centre of the global economy any more. China continued to grow at near double digits, as it injected fiscal stimulus, began to reorient its economy towards the development of a domestic market, and expanded its trade with the rest of Asia, Latin America, and Africa. For the same reason economies in large parts of sub-Saharan Africa that not long before had been in the headlines because of suffering with famine, became the new group of rapidly industrialising countries. According to the World Bank, Ethiopia enjoyed annual average growth of around 10.6% in the ten years between 2004/5 and 2011/12. Global growth overall was hardly stellar compared to the first stage of the long wave boom after 1999, but, given the continued significance of the EU and US within it, that was not surprising. Moreover, China which had boosted its economy in 2009, faced a problem not of economic slow down, but of over heating, which led its Stalinist leaders to begin to pull on the economic levers to deliberately slow growth! Some of the data included here is taken from my book published last year, so some of the statements talking about the latests quarter actually refer to 2014. The underlying point about global growth over that period, therefore, remains. The illustration of the difference between the “V” shaped recovery after 2008, in the US, UK and EU, and the consequences of austerity in derailing that are given in my post here. Crapola. One year from the trough of the recession that “ended” in the 2Q of 2010, US GDP growth was larger than that after 1 year of recovery from the 2001 recession and the 1991 recession. Two years into the recovery the post 2009 recovery had expanded GDP less than that of the 1982 recession, which was the second dip of Volcker’s double dip tight-money policy. What sectors account for the greatest deviation between these two recoveries? It’s in the contribution of personal consumption expenditures, and gross PRIVATE DOMESTIC INVESTMENT. These sectors increase between 82 and 84 about 7% and 6.4% respectively but show increases between 2009-2011 of only about 2% and 2.6% respectively. What’s the difference in a long-wave upturn, and a long-wave downturn, if the rate of growth in the volume of world trade in the upturn is equivalent to that experienced in the downturn? You want to do the comparison on a price basis? Sure thing. Adjust the value growth in world trade for the price of petroleum and tell me what you get. So… again what’s the difference between 1991-1999, and 2000-2008? Yes China has had a super boom, I’ve said so already. I think that is whats confusing you, China’s prosperity and its affect on the world economy has fooled you in to thinking things are better then they are. As far as recessions since 1999 haven’t we just had two so far? minus certain countries like Greece of course. By the way you can’t compare World War One and its aftermath to World War 2, read up on Bretton Woods. There was no Bretton Woods after WW1. The rise of Syriza and Podemos is linked to economic crisis not strength. Imperialism is an emergent property of capitalism, you can’t just fold it in to the business cycle. I feel we have reached the limits of this debate. There is a crisis coming soon, if you’re right it will be a short mild one. If I’m right it will be a doozy. You have once again failed to deal with the points. I’ve listed a series of economies besides China, both developed and developing for which your argument does not stand, as well as a string of data that contradicts it. On recessions, you claimed that the rate was higher than after WWII. But, as I pointed out that was on average 1 every five years on madel’s basis, which you were citing. On that basis in the 15 years since 1999, there should have been three just to maintain that rate, but you only cite two, without actually detailing which two you mean. You are right, there was no Bretton Woods after WWI, which leaves you to explain why not, given that you want to explain history and economic events on the basis of these random exogenous events, rather than recognising that what appear to be random exogenous events are in fact explicable, as Marx, and Trotsky describe, on the basis of the underlying objective laws of capitalism. I disagree about Syriza and Podemos. Look at previous periods of economic crisis, such as the 1930’s. It did not lead to the establishment of radical working-class organisations, but the opposite, demoralisation and atomisation, and a rise of fascist and other reactionary forces. I wasn’t folding Imperialism into the business cycle, I was explaining that the reason that capitalist states engage in various activities, such as a search for foreign markets and sources of materials, the reason they seek to establish international and intranational organisations is not simply some chance event, but is driven by objective economic and social laws. “As long as politics keeps flowing in the same forms, within the same banks, and at about the same speed, i.e. as long as the accumulation of economic quantity has not passed into a change of political quality, this type of clarifying abstraction (“the interests of the bourgeoisie”, “imperialism”, “fascism”) still more or less serves its task: not to interpret a political fact in all its concreteness, but to reduce it to a familiar social type, which is, of course, intrinsically of inestimable importance. There is nothing I have said, which suggests that the coming crisis will be a short mild one. In fact in my first book Marx and engels Theories of Crisis: Understanding The Coming Storm, I say the exact opposite. The financial crisis of 1847 detailed by Marx and Engels occurred near the end of a Spring phase of a Long Wave Cycle, and yet led to a 37% drop in economic activity, way in excess of what happened in 2008, for example. I agree. The limits of the debate have been reached, if those limits are circumscribed by “long wave” theories. How in fact does the supposed long wave “upturn” of 2000-2014 differ from the long wave “downturn” of 1985-1999, when for the 2000-14 period world GDP grew 234 percent, and for the 1985-1999 period world GDP grew by 253 percent (according to the World Bank data sets)? Or, using the WB’s World Development Indicators, in the period 1985-1999, cumulative growth in global gross fixed capital formation grew 62.8 percent, but in the 1999-2013 period it grew only 48.7 percent? All of which only means, you can pick your statistics and find what you had in mind from the getgo. Boffy’s boundless optimism is worse than hilarious, it’s pathological– supposedly the US had a “v” shaped recovery until…2010. Sure thing. The recession officially ended in 2009, so it was a very short, on one end of its “v.” So short you can’t assume anything about its “possible” shape; you can only assess its actual shape. Look at the “trend line” for the recovery in industrial output to match and exceed its previous high. That’s what gives you the true “shape” of a recovery. And then we get thesort of hallucinatory analysis that concludes that Podemos, Syriza, the Arab Spring etc. were all products of the “long wave” upturn, rather than the actual severe economic privations of the post 2007 period. Boffy’s got a cycle for everything, and seasons for every cycle, and it’s all just………baloney, crapola, junk, garbage. I’m glad Boffy addresses Simon’s points. That way I wont run out of opportunities to show how full of hot air Boffy is. WTF? There was a civil war in Spain, workers soviets, peasant soviets in Vietnam; pretty much continuous eruptions of civil war in Germany until 1933. In fact radical working class organizations were established and overthrown, defeated. Neither Syriza and Podemos are radical working class organizations. Well sartesian the Long Wave theory is useful if you apply Ernest Mandel’s approach to it. The take away is that Boffy is a Kondratiev man and therefore is compelled to put us in an Expansionary Long Wave or break with Mr K.
The Bretton Woods comment is bizarre though, obviously the reason why there was no Bretton Woods after WW1 is because you can’t predict the outcome of Imperialist clashes. I’m not surprised to see Boffy hedge his bets on the upcoming crisis. This is not 1847 though, well maybe since that came before the first expansionary long wave, Boffy gets the years wrong for the waves. Maybe this slump will pave the way for a Long Boom, I think it’ll probably take the nationalization of finance and the state taking over lending to productive capital. Or maybe World War 3. Oh, I think the vast majority of Boffy’s comments are bizarre, and barely maintain a minimal contact with immediate and past reality. That to one side however, what characterizes the “long wave” upturn from the “long wave” downturn? I would think those measures would be the same measures we use to measure changes year-over-year, or “short wave” upturns and downturns: rate of growth in capital spending; rate of growth in foreign direct investment inflows; rate of growth in industrial output; rate of growth in world trade; rate of growth in profitability of production– all that neat stuff that capitalists use to measure and adjust their own capital flows. The point being as witnessed by your own comments that you do not apply Mandel’s approach to the long wave either. You apply a very mechanical, and yet random approach to simply choose what facts you want to prove your preconceived opinions. So, for example, you rightly say that a consequence of boom periods is a development of the working-class, and claim that no such development has arisen. When I point to various examples of where such development has arisen such as Syriza or Podemos, you flip your position 180 degrees to claim that these are not an indication of the development of the working-class following a period of boom, but an indication of slump! You correctly pointed out that such developments of the working-class do not materialise immediately as a consequence of material changes in the economic relations, but when it comes to suit your argument want to ignore the fact that the explanation for these developments lies in the period of growth after 1999 up to 2008, and simply claim that it can be explained solely on the basis of the immediate economic conditions! That is both mechanical, and ignores the method of Mandel and of Trotsky, as well as that set out by Engels quoted above, which is that it is this preceding economic development that leads to the development, and the conjunctural shift which causes the its manifestation. In other words, workers gain strength and confidence, rebuild organisation in the period of growth, and then when those conditions change, the manifestation of that strength and confidence arises in the outbreak of conflict. Its why as Trotsky says, Mandel says, and as I point out, you do not get such periods of working-class resistance let alone advance following periods of stagnation! And incidentally, look at Trotsky’s graph and timeline of such long wave periods, which is also the basis of Mandel’s approach, and you will see that he puts things such as wars and revolutions down precisely to such conjunctural shifts. Your claim that the Financial Crisis of 1847 came before the first long wave expansion is bizarre. Trotsky himself dates the first long wave upswing from 1781, Marx and Engels detail the extent of the boom that ran from 1843 to 1865. You claim I get the years for the Long Wave wrong, but fail to specify. Mandel like most Long Wave theorists cites 1949 as the start of the post-war boom, and as he uses the same 50 year cycle period as other theorists, that meant he was able to understand that the end of the boom period would arise in the mid 70’s, as it did in 1974. In actual fact, Mandel had not always held that position. Rather like the catastrophists today, he along with others in the immediate post-war period continually expected the next “great recession” or long depression, to confirm the death agony of capitalism. When instead, capitalism continued to expand at a faster rate, and used Keynesian stimulus to cut short recessions, Mandel and others in the USFI flipped position, essentially becoming Keynesians, and believing that it was possible to keep using such intervention. By the time they reached this position, the material conditions had changed, and the long boom actually was coming to an end, and Keynesian demand management could not work to cut short recessions, and instead led to inflation, in a similar way to the fact that monetarism today does not work, and causes asset price inflation instead. However, the point is that according to mandel the long boom runs from 1949 to 1974. I agree. And with the same cycle length that gives a long wave downturn from 1974 to 1999. Now you can claim and no doubt you will, given your propensity to change the details to suit your preconceived ideas that the cycle length changed, but then you have to explain why it was that right on cue in 1999, primary product prices soared as global demand for them rocketed as growth and trade picked up. You have to explain the 30% rise in the global working-class in the ten years after that period, the doubling of global fixed capital formation in that same period, the fact that the annual growth of world trade was much faster in the period 1994-2000, in the run up to the start of that boom than it had been in the previous 14 years, and that in the period 2002-2007, that increase in global trade was even faster than in the period 1994-2000, and was 15 times greater than in the period 1980-1994! You also have to explain the growth of China and other merging markets during that period, the industrialisation of large parts of Africa, the spread of social democracy in Latin America and so on. But, no doubt like every other subjectivist you will see all these events as unrelated, and simply random exogenous occurrences unrelated to changes in material conditions. In other words, you will totally disregard Marx’s theory of Historical materialism. As you say, there seems little point in continuing a debate on such a basis, where your view of historical development is so divorced from that of Marxism. Well there you have it, Boffy loses the debate so he resorts to name calling. I’m a heretic or an infidel of some sort, to Boffy Marxism is religion look at his web page he quotes Marx like the Bible. Let’s recap, I am a supporter of the Ernest Mandel view of Long Waves of capitalist development. Ernest Mandel believes that though an Expansionary Long Wave will always end no matter what in a Depressionary Long Wave there is no automatic guarantee that a Depressionary Long Wave will end with a new Expansionary Long Wave. Ernest Mandel believes you need more then just the day to day workings of capitalism. Gold rushes, revolutions, Imperialist wars assuming that these revolutions and wars end in ways favourable to a new long term expansion. I have explained how the three Expansionary Waves were started, Boffy has found himself flustered on all three accounts. He even tried to imply that the outcome of WW1 was pretty much identical to WW2! He has produced nothing to demonstrate that significant events allowed for a Long Boom after 1999. Now he could stick to supporting Kondratiev, he’d be wrong in my mind but then we wouldn’t have this nonsense about how I am betraying Marx and Mandel by simply reiterating a theory exactly as Mandel himself stated it! By the way Marx never developed a Long Wave theory, that didn’t start until the end of the 19th century. Mandel’s theory is a much updated version over Kondratiev, it may be wrong but I think it is more accurate and takes in to account contingent factors in history. Explain China? China was expanding well before 1999, China isn’t the whole world either. Explaining China is something I don’t think Boffy can do in any case. To finish, Marx isn’t always right, neither is Trotsky or Ernest Mandel. I’m open to having my mind changed on Ernest Mandel’s views if I see evidence for doing so, Boffy has failed miserably in this respect. Admitting to mistakes in even great men like Marx is important, it doesn’t malke one a heretic. Treating Marx or anyone else like a Prophet is not the way to go. Name calling? Really? Any more than your comments? I haven’t bothered reading any of the crap that the troll, Artesian, writes for more than a year, but I’d like to bet that anything I might have said that you take offence to appears as the height of politeness compared to his usual ranting and abuse. Lost the debate? I don’t think so. You have failed to present any facts or arguments to support your assertions. On the contrary, when challenged on them on each occasion you have dropped the assertion like a hot potato, or even simply reversed your position. In similar vein you claimed that an indication of a period of boom was an improvement in the condition of the working-class, a development of its organisations and so on. Then when I showed that there is plenty of evidence of such developments, such as the growth of the Chinese working-class, the rise in its living standards, the growth of social-democracy in Latin America, and finally Syriza and Podemos, you again flip 180 degrees, to claim instead that this was an indication not of boom as you first stated, but of slump! Once again you made no attempt to actually challenge the facts. But, even on your own highly suspect means of arguing, your position is not tenable. You say that there should be some exogenous shock that provides the spark for the conjunctural shift that sets off the new boom, similar to what happened after WWII. Yet oddly, you seem to have missed the fact that in the 1990’s, imperialism won the Cold War, the USSR collapsed, all of its satellite states in Easter Europe were drawn into the orbit of the EU, the US and western economies alongside China began a process of massive investment in the USSR’s former Central Asian republics to produce oil, copper, gold and other minerals on a massive scale. In addition to the hundreds of millions of Chinese workers brought into the orbit of capitalist exploitation, the whole of eastern Europe was brought back into the realm of exchange value. It could also be pointed out that this exogenous event itself came towards the end of a period of stagnation, and defeat and atomisation of the global working-class. Is that a big enough exogenous event for you? Or would you like to reverse your argument once again to explain that to fit your assertions? ” predicted that the ‘thirty golden years’ of the post-war boom could be expected to end soon”. (Louca), which placed the end (30 years) in the mid 70’s. In fact, the problem of placing too much emphasis on exogenous events, is that even when it became clear, as louca says that the boom did not end until 1974, after the experience of May ’68, the Prague Spring and so on, Mandel kept 68, as the date of the end of the cycle. Any way too busy now to pursue this further. Actually, having immediately after spotted these comments I had to respond. But, what you have said is not what Mandel says, as Louca illustrates. “This theme was already dealt with by Mandel in 1985, in a paper where he discussed the distinction between endogenous and exogenous variables. In his view, endogenous variables, from the economic point of view, are those describing the automatic processes flowing from the system’s structure: These can determine the speed, direction, degree of homogeneity/ heterogeneity of the development. They cannot alter the nature of the system or overturn its general historical trends … Besides the inner logic of the system, exogenous factors are at work, which partially co-determine the system’s development, at least at short- and medium-term ranges. settings. Hence any interaction between endogenous and exogenous forces is always limited by these parameters, by these constraints, it reaches its limits when it threatens to eliminate basic mechanisms of the system. “I have explained how the three Expansionary Waves were started, ” How, where. You did no such thing. I said no such thing! I simply pointed out that if you are going to claim that Long Wave upswings are the result of random exogenous events such as wars or revolutions, as you proposed with explaining the post war boom, then you have to explain why it is that one of these exogenous effects is not as good as another, why similar events have different consequences at different times, and the obvious explanation for that is precisely that they do occur at different times, and different underlying material conditions exist. Moreover, you have to explain why it is that the long wave upswings and downswings occur with such regularity. Are you claiming that just the right kind of exogenous event just happens to come along every 50 years to kick start the beginning of the next upswing. Is that not a bit of a religious belief that something just happens to turn up when its required? In short you have produced no facts to back up anything you have said, you’ve flipped your position simply to hold on to your argument when you couldn’t defend it. You complained about being insulted, but in reality you are insulting our intelligence with the froth you have put forward. I know Boffy hasn’t read anything I’ve written in years, so perhaps somebody should ask him for his data sources on the increased average annual rate of growth in world trade 2000-2014 vs. 1974-1999; increased rate of growth in gross fixed capital investment for the two periods; increased growth in inward FDIs between the two periods; oh yeah… and add this one, increased rate of growth of the working class in 2000-2014 vs 1974-1999. And this: “Yet oddly, you seem to have missed the fact that in the 1990’s, imperialism won the Cold War, the USSR collapsed, all of its satellite states in Easter Europe were drawn into the orbit of the EU, the US and western economies alongside China began a process of massive investment in the USSR’s former Central Asian republics to produce oil, copper, gold and other minerals on a massive scale.”– numbers and dates please, because if it happened when you said it did, that’s part of the long downward wave. I could point to lots more cases of saying that Marx was wrong on particular points even in the last few weeks, as well as in the Introduction to my new book. Anyway, I’m too busy now writing another book to be wasting time on this. Who the hell is publishing your book? You can’t argue your way out of a brown paper bag. Partial autonomous variables? Ernest Mandel never argued that! You give us someone elses opinion on Mandel rather then Mandel himself and try to present it as the final word! I have backtracked on not a single thing. You talk about technological innovation, I point out that depressionary long waves can see substantial innovation. Was not the assembly line, one of the greatest qualitative developments under industrial capitalism, rolled out during the depressionary long wave that started in 1913? This depressionary long wave lasted longer then 30 years, so nuts to any notion that everything runs on 50 years clockwork. That’s one of the major points I’ve been arguing in this tedious drawn out discussion full of Boffy’s misrepresentations. Yet he calls me mechanical, although he also calls me random and subjectivist at the same time, a subjectivist machine? It’s hilarious for him to say I haven’t proved the exogenous factors which started the three waves since I layed them out so clearly a small child could get it. If you want the best proof for why we’re not living in a post 1999 expansionary long wave, just read this site! Michael Roberts’ site has tracked the decline of capitalism for years and Boffy, the troll comes here again and again to say nuh uh! Again and again and again, if you believe in falling profit rates you’re a Malthusian according to Boffy who doesn’t know what a Malthusian is. It’s nice to know though what he thinks of people who disagree with his orthodoxy, I just wished he’d found actual religion instead of making Marxism in to one. Then he’d be haranguing some other poor blog readership. One last time; can somebody, anybody, tell me the parameters by which we measure and distinguish the “long wave upturn” from the “long wave downturn”?